IF you were to conjure up a vision of how Lexus got to where it is now from when it was first introduced in 1989 in the United States, you would have a pretty good idea of the direction that the luxury vehicle division of Japanese automaker Nissan is planning on. 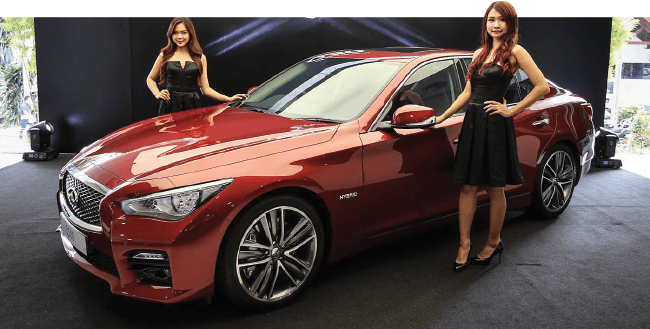 Infiniti is Nissan’s luxury sub-brand which should now be seen as a serious premium brand in its own right — going after the likes of BMW, Audi and Mercedes-Benz. The Infiniti Q50 sits between the BMW 3 Series and 5 Series in size. Its trump card lies in Formula One. It is a title partner and vehicle performance partner of Red Bull. Yes, Sebestian Vettel was involved in the testing the Infiniti Q50. And yes the Q50 hybrid hits 100kph in a tingling 5.1 seconds while the 2-litre GT premium (RM278,800) turbo-charged model does in 7.2 seconds. The 2-litre direct-injection alloy engine produces 155kW and 350Nm while claiming 7.3L/100km with a stop-start fuel saver system. The Q50’s drivetrain is from Mercedes-Benz although Infiniti’s version of the engine has specific tuning. Powering the Q50S 3.5 Hybrid is a 298hp, 338Nm 3.5-litre Atkinson-cycle V6 mated to a 62hp, 270Nm electric motor, a lithium-ion battery and a seven-speed automatic transmission. Top speed in both cars is electronically limited to 250 km/h. The 2-litre, equipped with a 2.0 turbocharged engine is the focal point, and it should present an interesting alternative to buyers as it has most of what’s found in the hybrid kit wise. And its drivetrain isn’t a slouch either while the hybrid is a bit of a rocket, its extra power making it a great highway cruiser. The 2-litre turbo four-cylinder rear-drive sedan has a seven-speed auto and runflat tyres as standard. Standard fare in the Infiniti Q50 would be two touchscreens for infotainment controls and satnav, LED headlights, Bluetooth audio and phone link, climate control, active noise cancellation system, digital radio reception, tyre pressure monitoring, leather trim, power front seats and keyless entry. Wheel size in the 2-litre is 18-inch and it also comes with adaptive steering with active lane departure control, a Bose 14-speaker sound system and a sunroof. The hybrid rides on 19-inch alloys and adds active cruise control, active and automatic braking systems, active lane departure and blind spot warning systems, the clever-around view camera system and active headlights. Both the 3.5-litre and 2-litre turbo have a flexible and enthusiastic engine. The top-spec model’s steer-by-wire system isn’t as convincing and on the open road it’s best left in standard setting, with sport mode kept for corners. But, this is the future — although its all-electric steering is spooky — it works. There are three touch-screen selectable ratio settings, Sport, Standard and Eco, plus a Personal setting allowing a mix and match. Sport is very direct. Eco is simply too flabby while Standard about right most of the time. The best setting was a combination of Sport (for its increased “rack” speed) and Standard for its better “weighting”. Across the board, the handling of the Q50 is impressive. It is, of course, a compromise — this car is for the commute for the executive classes afterall. While the 3.5-litre doesn’t accelerate at the speed of thought, it is leagues beyond most other hybrids. Speed junkies might note it ranks a hair ahead of either the Lexus GS450h and even the big Porsche hybrid. Some initial lag can at times be briefly detected from the electric motor. The brakes haul the all-around-balanced car down very quickly, but at times the feel may not be equal to some of the best sports car brakes. Around town, its stop/start function is excellent, and power transitions are seamless between gas, electric, and both. Rear seat room is good enough for adults but anyone above 180cm will be short of headroom. Boot space of 500 litres is good despite the prominent wheelarch intrusion but the footoperated park brake seems old-school for a brand with hi-tech tendencies compared to the Audi A4. The interior isn’t half bad. With sumptuous, softly textured leather trim and an “engineered” look to the polished metal highlights, few could argue with the premium quality feel. I like the twin screens of the centre stack and the styling and functionality of the console and instrument binnacle. It looks sharp and it works well, particularly the flush look and “In Touch” smartphone functionality (with app-style icons) and connectivity features of the lower screen. The neatly-stitched leather seats are generously padded and very comfortable front and rear. A nice touch, also for all models, is that the driver’s seat moves down and the wheel lifts automatically to aid entry and exit. The Q50 is fully-featured with ABS, adjustable speed limiter, rear view camera, front and rear parking sensors, tyre pressure monitoring, ISOFIX mounting points, front to rear curtain airbags, side airbags, driver and passenger airbags. and, in S and S Premium models, distance control assist, and blind spot monitoring among a host of premium safety features. Can this be the one? Does Infiniti finally have the car that is going to put the brand on the map? Both are fine cars. Under the bonnet, the Q50 has got the firepower to match their competitors toe-to-toe. The V6 hybrid is particularly impressive. It’s fast — you’d expect no less from a premium sporting saloon — and it’s beautifully trimmed and comfortable on-road. It’s not known for the beauty of its lines, Infiniti, but this one works. More to the point, it goes. So here lies the challenge: this car is good enough to sell well. I think so but you need to test drive it yourself. Here’s the new angle. If you have been looking at the 3 Series, Audi A4 or Lexus IS, and you’re looking for “bang for your buck”, you now have another car to consider. With the Q50, its features and performance, Infiniti has quite possibly come up with the best buy of the moment in the premium sector. This article first appeared in The Edge Financial Daily, on December 29, 2014.